Artists and professional photographers require true archival print media in a variety of weights and surface textures for their digital fine art and photography. 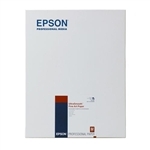 Now Epson brings you an acid free, 100% cotton hot press paper that is coated on both sides for extra versatility. This cylinder mould-made product, features an ultra smooth finish on two sides (sheets only) that is optimised for our photographic dye, Epson UltraChrome and Archival Inks. Offered in a variety of sizes and formats, this fine art paper is not only acid, lignin and chlorine free, it is also buffered with calcium carbonate for a true archival sheet. Like all Epson's innovative media, this paper is engineered to give you the highest resolution and colour saturation possible.